In a large saucepan add olive oil, garlic, cook around 2 minutes. Add celery hearts, tomato paste, tomatoes, wine, herbs and spices. Add chicken broth. Add the beans. Simmer around 25 to 30 minutes. In the meantime cook pasta. 1 cup orzo cooked or any kind of small pasta (I always use two different kinds but you can use all ditalini if you want too. Cook pasta in boiling water in a sauce pan. Drain and add to the pot of beans and sauce when cooked. Mix together. Serve with grating cheese. This must be so very tasty with Burgundy! This sounds great and I like the beans and two pastas together. I wonder how it would be with a little chopped kale thrown in. It looks delicious. I love the fact that you use celery hearts in here too. I love pasta fagioli and the burgundy additon sounds like a winner, I have never though to include the wine. Nice. This does look so authentic, a true italian feast here! Love your version with the burgundy wine and the celery hearts in there. Yum! This was my Friday meal growing up. Love the orzo and the pasta. A little more chew in the dish! 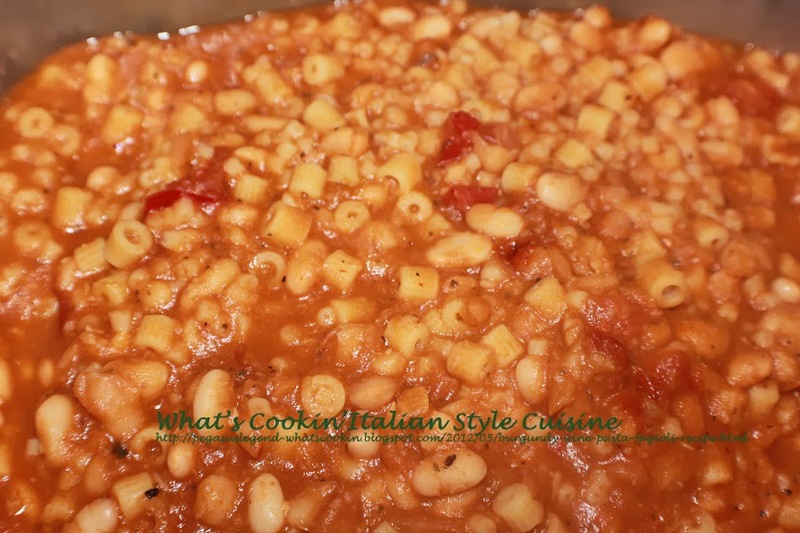 I love pasta and fagioli. Sometimes I add a little diced pancetta and brown in the olive oil before adding the rest of the ingredients.